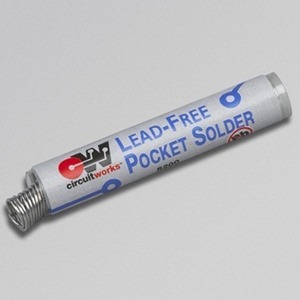 CircuitWorks® Lead-Free Pocket Solder is the high-purity pocket-sized solder in a convenient dispenser for rework and repair. This rosin core solder wire is manufactured from the lead-free solder alloy SAC 305. Lead-Free Pocket Solder is easy to use and produces reliable solder joints every time. Its activated pure rosin flux core eliminates troublesome solder voids. Instant wetting action provides thorough deoxidation of metallic surfaces providing the best possible surfaces for soldering.